As Dubai becomes more connected and invites foreign investment, its property market should benefit. Global property prices increased on average by 2.1 per cent in 2017, up from 1.6 per cent the previous year, according to Knight Frank’s Prime International Residential Index. Oversupply in Dubai, however, has meant that prices here softened by 5 per cent over the same period, although the picture is brighter than this statistic suggests. The Dubai market has always been relatively volatile, with textbook market cycles seemingly accelerated within a very short timeline. Such behaviour can be expected in growing markets, with each significant price movement resulting in a slightly more measured response. But the market does appear to be maturing. Performance has improved over previous years and sentiment is also encouraging, with the impact of caps on borrowing, caps on loan payments and falling oil prices starting to recede. Supply side issues appear to be inhibiting this early stage positivity, although some neighbourhoods have been impacted more than others. Significant oversupply in Downtown – Dubai’s central hub – is dragging down average property prices, whereas market sentiment in more upmarket areas such as Emirates Hills, The Lakes and the Palm Jumeirah is positive, as an abundance of amenities, high-quality properties and good transport links continue to attract demand. Dubai’s property market is made up of a diverse investor base, with over 200 nationalities investing in the 18 months to June 2017. The market has drawn significant Chinese investment and the country now ranks sixth-highest for inbound property investment, having been eighth-highest as recently as May last year. 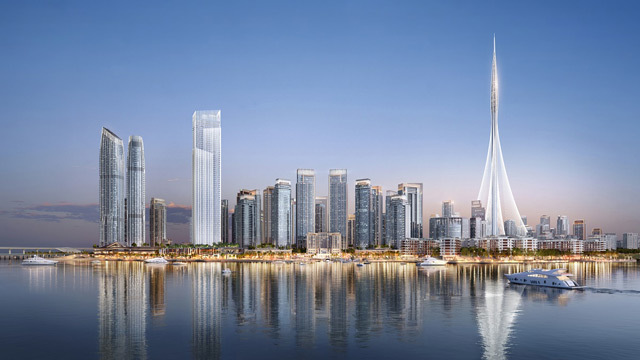 A policy shift that grants Chinese nationals visas on arrival in Dubai has been a key driver of this, as well as the increased connectivity permitted by direct flights to 13 Chinese cities. Similarly, with direct access to Dubai now available from 12 US cities, an increase in tourism should result in increased investment from US nationals. The current weakness of the US dollar, against which the dirham is pegged, presents buying opportunities for other international investors too. Purchases denominated in the British pound and the euro are still benefitting from a relative discount, while those made in Russian rouble can secure property 12.5 per cent (Knight Frank research) cheaper than a year ago. Meanwhile, the UAE government’s commitment to stimulating the local economy as well as recent visa and foreign ownership changes will no doubt benefit property prices in the long run. Forty three per cent of its 2018 budget is earmarked to develop important sectors such as infrastructure and transport, as well as public services and the development of a knowledge-based economy. This commitment will very likely result in overall economic stimulation and growth in the property market. That said, the viability of international property investment into Dubai should be taken in context of other global opportunities. As a direct contrast to Dubai’s emerging market, exploring one of the world’s most mature property markets, London, will make for a useful comparison.